We had the opportunity to review a physical copy of Fix It! Grammar The Nose Tree Student Book 1 and the Fix It! Grammar The Nose Tree Teacher’s Manual Book 1 from the Institute for Excellence in Writing (IEW). Hello, my name is Jennifer and I am an official member of the Grammar Police. I wear my titles well and with no shame, because I love grammar. It does not mean I always get my grammar correct, but I am a stickler for the use of good grammar. I was excited about the opportunity to review Fix It! Grammar, because it came just at the right time for my children. We hit a wall with our grammar studies. I love what they have been using, but my children do not. I knew it would take a thorough and comprehensive curriculum for me to make a change and I think I have found it in Fix It! Grammar. Fix It! Grammar is a six-book, incremental grammar program written by Pamela White who has an M.A. in English and A.B.D. and is a certified IEW instructor. It is geared towards students in the third through twelfth grades. 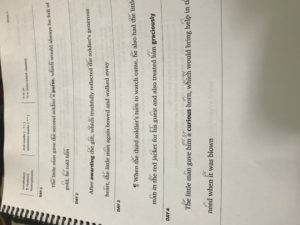 A student works through the text in a level book by reading passages from a piece of literature and making grammatical corrections to the text. At the end of the week after editing the passage, the lesson finishes with the student rewriting the passage with proper form. The curriculum comes with a spiral-bound student book and teacher’s manual. I suggest you purchase both to teach the course effectively. 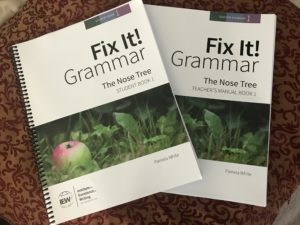 There are 33 lessons in each book with grammar instruction and practice that are to be completed over a four-day period. The time spent daily on the lessons is 15 minutes. The idea is for students to complete one book each school year. If you have a high school student and are just starting the program, you could have your student spend more daily time each week and complete more than one book in a school year. If a student has previously used IEW studies, they may be familiar with some of the terms that are used. If not, you do not have to have used an IEW program to use Fix It! Grammar. The books include a glossary with definitions of a number of grammar terms (ex: prepositions, punctuation, stylistic techniques and more). The glossary is a great resource for the material covered in the book. If my children asked for help with one of the lessons, I asked them to refer to the glossary first. They were usually able to find the answer they were looking for in that section. More help is included in the student book with quick reference grammar cards. Along with the student book, students will need a spiral notebook in which they will write vocabulary definitions and their rewrites of the passages. I was hesitant to start my high school children in the first book of the series, which is written for children as young as the third grade. Something to keep in mind is that the series is more geared towards skill level than grade level. White recommends students start in Book 1, because each level builds on the previous one. If you think your child is ready to start in a higher level, you may have them take the placement test. I decided to just start River and Lily in Book 1 to be sure they had a familiar foundation for the future levels they will complete. I was really happy they looked forward to completing the daily lessons. They commented on how much easier (user-friendly) the program is to understand. The concepts are presented in a less formal nd more familiar manner. They both were able to work through the daily lessons together. We started the week with me giving a brief overview of what they would be covered. I like the inclusion of the vocabulary and dictionary work. 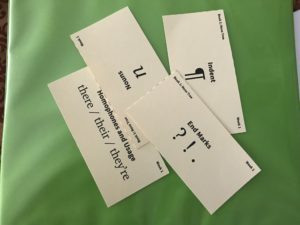 We reviewed the grammar cards for the lessons that included them. The next couple of days were used to work through the exercises. It really only took them 15 minutes to complete. I love the formatting instruction (ex: indenting, etc. ), because that is so important when it comes to writing and forming paragraphs in writing. They are enjoying grammar more now. After using Fix It! 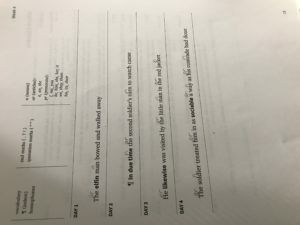 Grammar with my children, I was able to see a difference in their work. They enjoy the short, but thorough lessons, which is almost half the time it took them to complete the other program we were using. They like hunting for errors and they love that the lessons only require 15 minutes of time each day, Not only are they “getting it”, but they are liking it. One of the reasons I believe Fix It! Grammar is appealing and works with students is because there is a purpose for learning working through the material other than just finishing the work. They are ready an interesting story. The passages are what makes this program so unique. Instead of students spending time writing and editing random sentences for practice, they are “writing” (i.e. correcting) a story. One thing I really like about IEW is it sets you up to succeed. Beyond the teacher’s manual, which is very thorough, IEW also has help videos that and offers webinars for its products. I like that the student is not only learning grammar, but they are also improving their handwriting, vocabulary and reading some good literature. It was nice to have access to print copies of the lessons, which is available in an E-book format. A code is included in the Teacher’s Manual, which gives you to your online account at IEW. Because of that, I was able to start working through the book with both Lily and River when the set arrived. I did not have to order and wait on a second book. That is a wonderful perk for families with multiple children. I think honing grammar skills is important enough to continue through high school. I would like both River and Lily to complete as much of the series as possible, so I plan to increase the pace in which they are working through the study. They can work to complete two books per school year and that will get River through almost all six books and Lily through all six books before they graduate. IEW includes PDF samples on its website of both the Teacher’s Manual and Student Book, so you may get an idea of what the pages for each level look like. Read Fix It! 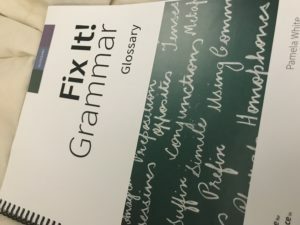 Grammar to learn more about Fix It! Grammar and purchase.